SNES Marvel Super Heroes: War of the Gems (USA) in 18:51.85 by Dooty. 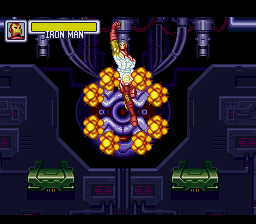 Marvel Super Heroes: War of the Gems is a platform game featuring Spider-Man, Captain America, Iron Man, Hulk, and Wolverine. In it, you must collect Infinity Gems (Also known as Soul Gems), which possess special powers, before they fall into the wrong hands. Luckily, you can equip the ones you have to help you find the ones you don't. This game should not be confused with an arcade fighting game with a similar name. The player, Dooty, primarily uses Iron Man to boost through the game in less than 19 minutes. He does this with careful planning, clever boss strategies, and a whole lot of gems. Never once in this run does he take damage. For more information, please see the author's notes.